This month featuring new collectible discoveries, letters, the Mike Humbert Department and more! 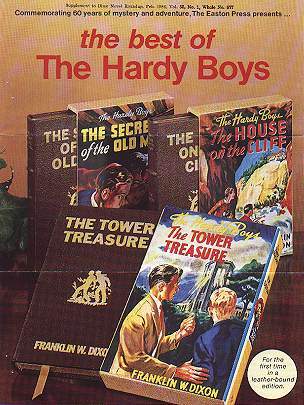 The End Of The Hardy Boys ? Could it be heavy weather ahead for the world famous teenage sleuths? Are dark days due to daunt this daring duo of dynamic detectives? Could craven coin counting corporate curmudgeons cause calamity curtly cancelling crafty crime cracking kids? Simon & Schuster is playing games again with the release date of Digest #162 The End Of The Trail. They moved it up to May, now it's back to July. 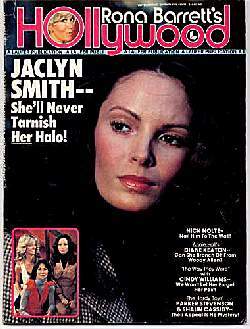 Who knows if it will ever hit the stands? The title itself sounds very ominous. However, #163 The Spy That Never Lies, has been scheduled for a September release, so maybe they aren't ready to give up yet. As reported earlier, The Clues Brothers is dead after Volume 17 The Bike Race Ruckus and the books are being allowed to go out of print. Likewise the Casefile 3 in 1 Collector's Edition series has been terminated after only three volumes and they too are going out of print, although I must say I won't miss them. Smithmark delayed the release of their second 3 in 1 DJ hardcover for a couple of months and now have rescheduled it for September. I'm starting to wonder if it will ever see the light of day. One source tells me that while Smithmark claims the first volume was a sell out, the chain bookstores have ventured a differing opinion. On a more positive note, Casefile #16 Line Of Fire is scheduled to be reprinted. Of course, this has been listed on Amazon.com for several months already but maybe, just maybe, it will be released. As to why they chose this title above say, Brother Against Brother, I'll leave for greater minds to debate. Happily, Applewood Books seems to be forging ahead with the reproduction First Edition series with the recent release of Volume 10 What Happened At Midnight and the announced October release of Volume 11 While The Clock Ticked. The earlier titles have already gone through several printings and the project shows no sign of slowing down. Thankfully, the "Just As You Remember Them" logo was moved from the cover to the spine. It would be nice if they would reprint the earlier covers in this fashion and/or sell them in a boxed set as they did with the Nancy Drew reprints a few years ago. It's hard to say what the ultimate fate of the Boys will be but, right now, it's not a rosy picture. MOONSTAR has a pretty neat Hardy Boys fan fiction site. Readers of my Bayport Connection message board are probably familiar with some of the authors here. There are several stories and stories in progress now online with more promised in the future. Includes the playlet "The Hardy Boys and the Mystery of Where Babies Come From" - Publisher & date unknown. 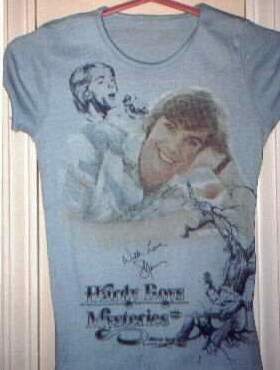 September 1977 - Article about Shaun Cassidy/Parker Stevenson & The Hardy Boys show. Light blue short-sleeve instead of the pale salmon long-sleeve seen before. It seems the Casefiles are starting to be reprinted! 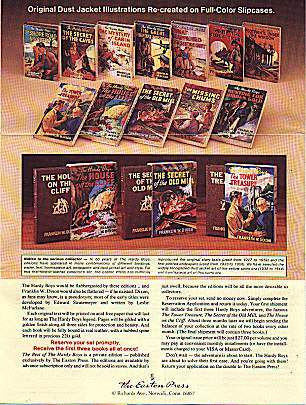 This particular brochure was included in the February 1986 issue of Dime Novel Round-Up. The original issue price of these books was $27.00 each and that initial $324.00 investment would easily be worth well over $1000.00 in today's market! 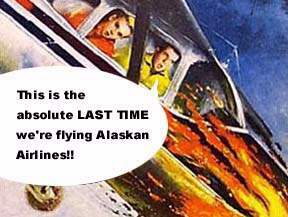 Special thanks to Frank Townshend for sending me this! 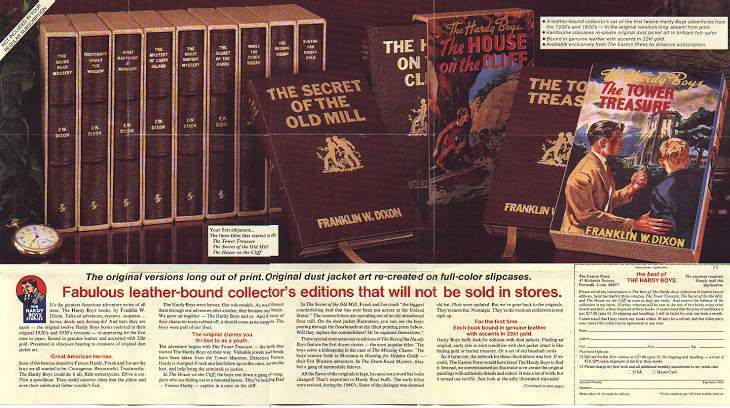 While many, if not most, editions are common, there are some Hardy Boys books that even advanced collectors may not have in their collection. I'm NOT including any of the various permutations of flap/back cover listings, some of which are very scarce but rather concentrating on editions based on major changes/revisions to binding, text, format, etc. While The Clock Ticked - Red Binding (1932) - Only the 1st edition came in this format. Extremely difficult to locate. The Short-Wave Mystery - Maroon Binding (1945) - Was this done in error? Probably but who knows? Very tough to find. Any DJ edition with the "Mickey Mouse Club" promo wrap (circa 1956) - I've only seen The Clue In The Embers with this. Forgeries of the wrap band are known to exist. A Hardy Boys Handbook: Seven Stories Of Survival - Hardcover with dustjacket (1980) - All the Wanderer hardcovers with DJ's are tough to find but this one is almost impossible! The House On The Cliff - Wrap DJ with "This Volume Free" overprinting (1959). The Hidden Harbor Mystery - Revised text with dustjacket (1962). The Missing Chums - Original text PC edition (1962). The Ghost At Skeleton Rock - Revised text PC with the original cover art (1966). The Mark On The Door - Revised text PC with the Gillies cover art (1970). Any of the Easton Press slip-cased, leather bound editions (1987). Honorable Mention: Any book with the brown Gretta endpapers, Dustjacket editions of The Mystery Of The Chinese Junk and Mystery Of The Desert Giant, just about any PC edition with the "$1 Box", editions with Rogers DJ art and the Greycastle Press large size PC editions of the first 10 Casefiles. The adventures of Frank and Joe as they would be now at around 90 years old. Joe: Frank! Frank! Wake up! We have a mystery! Joe:A MYSTERY - you deaf, demented, cantankerous old coot! Frank: Who are you calling old coot? Anyway, I'm hungry. Let's ask mom to make our lunch. Joe: Gosh Frank, Mom's been dead for over 30 years. Frank: Gee, that is too bad Joe! You think we should ask Dad? Joe: Uh, Dad ran off to Pago Pago right after mom died. Frank: Oh, right! Then let's ask Aunt Gertrude. Joe: Gertie was strangled by an irate New York City cab driver 47 years ago. Frank: She deserved it too, the old battleaxe! Anyway, let's go to Chet's to eat. Joe: Chet stroked out at his bachelor party about 65 years ago. Frank: I told him he was too fat - always at the Automat! Well, maybe Iola's home. Joe: I divorced her 60 years ago after she ran off with Biff Hooper. Frank: HA! I told you she was no good! Biff too, that mullet-head! Anyhow, we can go to Callie's. Joe: You divorced her 50 years ago after she ran off with Phil Cohen. Frank: Biggest favor Phil ever did me, the poor schnook! Let's go to Tony Prito's pizzeria. Joe: Tony's still on the lam from a Federal RICO indictment. Frank: Golly! I guess it's just too bad for us that we busted him! Well OK, then where are we going to eat? I've pretty near finalizied the character images for the Cabin Isle trailer. Here's an image so you can see how things are going. The colors still need some work, but I'm pretty pleased by the current state of things. I've found some really great orchestral music to use, and I'm currently trying to obtain the rights to use it in the production. Wish me luck (I'm gonna need it)! Sure, although the project may not be exactly what you seem to think. I'm a recent graduate of the Pennsylvania Academy of the Fine Arts in Philadelphia. My interest in art has centered around the process entitled tromp loeil, or trick of the eye painting. An anecdote from ancient Greece told of a painter who could paint grapes and still life paintings so realistic that birds would fly down and peck at the painting's surface, tricked into believing that the fruit was real. Another great Grecian artist challenged him to a sort of paint-off to see who was the greatest. Both were to create a painting and present it. They would be displayed with a cloth over them and revealed to be judged. On the day of the judging both paintings were present, both with fine cloths hiding their creation. The first cloth was pulled away revealing a great still-life so life like that, again, birds swooped down to peck at its surface. The contest seemed to be clenched until the judges went to remove the second cloth. . . only to discover that it was a painting of a cloth! So while one had fooled an innocent eye, the other had fooled the learned eyes of man. This seems to be the first tale of this kind of trick painting. Artists at the turn of the century like John F. Peto created paintings of money and other flat objects meant to fool the eyes of observers into thinking of them as real objects tacked onto various materials. The artist Mark Tansey created a modern painting of a cow being shown an idealized painting of cows. The bovine was surrounded by scientists who are measuring her response to the bull in the painting. This painting is entitled "The Innocent Eye Test" and seems to speak to this tromp loeil aspect of realism. Now, my interest is to take this into a more modern context. Not relying on simple visual trick with oils, I wish to create products anew that don't exist, but can be believed as real. My main focus on this front has been a series of violent action figures entitled War Joe. However, in order to better allow people to make the jump required to believe in the total fictional product, I also present a currently existing and believable product that I have altered slightly. This is where the Hardy Boys Mystery Stories come into play. Utilizing the phenomia known as a Mary Sue, I have put a third character, loosely based upon myself, into the beloved series. This third character, Peter Hardy, was first realized by adding a new character image onto the covers of the book illustrations. I painted this character directly onto the book covers using watercolor and gouache. Now, I have been working on a fictional movie based on the book The Mystery of Cabin Island. While there is actually no movie, I've been working to present this in as believable way as possible. I'll be using the internet for this purpose. I'm creating a web page for this movie. When completed it will be presented as a real movie. Supporting files available for download will include wallpaper, screen savers, the theatrical one sheet poster, and a movie trailer for the animated feature. While the animated movie doesn't exist, it's the presentation of a believable trailer that I've been working on. EDITOR: Thanks Pete, I'm sure the readers of the Bayport Times will enjoy both seeing and learning more about this interesting project - I know I will! Readers - As soon as Pete sends me enough material, it will be featured in an upcoming edition. EDITOR: It would be nice if fans that have copies of the shows that aren't commercially available could get together to swap copies. Interested fans can post a notice on THE BAYPORT CONNECTION message board. Editor: The Digests are the paperback books printed by Simon & Schuster under their Wanderer and Minstrel imprints. They started with #59 Night of the Werewolf and continue to this day. Only books 1-38 were rewritten/revised. EDITOR: Unless otherwise stated, I write everything that appears in The Bayport Times and the Unofficial Hardy Boys Homepage. I am the author of a recent book on the life of Hardy Boy ghostwriter Leslie McFarlane, and also was responsible for a short write-up entitled "About the Hardy Boys" that was included in the brochure advertising a historic walking tour of the Town of Haileybury featuring Hardy Boys sites. It was recently pointed out to me that in an issue of your Bayport Times on-line newsletter, it was alleged that passages from your "FAQ" and "Original Series" web pages were reproduced in the Haileybury brochure. Since this is the first time I have ever been accused of plagiarism, I though I should respond to this accusation. Firstly; I was disappointed to read the allegations in your newsletter. I had never viewed or even heard of your web sites at the time I wrote the introduction to the walking tour. The information in my article was original, and based on research I had done in writing the book on McFarlane. Secondly; although there are some similarities in the information included in my article and what you wrote in the "FAQ" and "Original Series" pages, this is perhaps not surprising considering the small pool of available information about McFarlane, Stratemeyer, the Hardy Boys series, and other historical data relating to the series. There are, however, enough significant differences in the passages, that they could certainly not be said to be identical. The information I included was based my own research, including personal interviews with Leslie McFarlane's son, Brian McFarlane in Toronto in 1996, interviews with McFarlane's relatives living locally in the Haileybury area, and a review of autobiographical books written by Leslie McFarlane himself. It is unfortunate that the perception exists that your work was reproduced verbatim in our brochure, and it would be doubly unfortunate if this results in a rivalry or an impediment to what could be a relationship of mutual benefit. I don't expect a retraction, since I think that would be counterproductive, and as a member of the TAHA Hardy Boys Committee, I would prefer to be working with you on a cooperative and sharing basis on what is obviously a mutual interest. EDITOR: I have the Hailybury promotional brochure in my possession. It reproduces WORD FOR WORD certain portions of my web site. Furthermore, other portions which are not identical are so slightly modified as to be clearly recognizable. This goes far beyond a mere duplication of commonly known fact. How you can write a letter such as this when I have irrefutable proof contradicting every one of your ludicrous assertions is beyond my comprehension. The mere mention of a retraction is a display of gall and effrontery the likes of which I've seldom seen! Your idea of "working with" me seems to be ME doing all the work and YOU taking all the credit.